Coming off a huge offensive season with the Regina Pats in the Western Hockey League (AHL), Connor Hobbs came to the Hershey Bears with high expectations for the 2017-18 American Hockey League (AHL) season. The young defenseman came nowhere close to meeting those expectations. Hobbs’ rookie campaign, like the Hershey season, was a disappointment (3g, 13a in 44 games). A young player can take that failure in one of two ways. He can get down on himself and continue to make mistakes or he can take that failure and use it to make himself a better player. To his credit, Hobbs chose the latter, and his improved play has been a big reason for the recent resurgence by the Bears. As a rookie, very little went right for Hobbs. Early in his inaugural campaign, the Regina, Saskatchewan native suffered a fracture wrist. The injury would sideline him for six weeks and slowed his development. After returning, Hobbs was thrust into a role he was not yet ready for. Then Hershey head coach Troy Mann paired him on the top defensive pairing with veteran Aaron Ness. Unsurprisingly, Hobbs struggled with the responsibility. His game was not developed enough to handle the role. He would force passes in his own zone instead of making the simple play to get the puck out of the zone and committed too many turnovers. He was consistently out of position and was caught up ice on too many occasions. Also, he struggled handling forwards coming at him in his own zone. Offensively, Hobbs was nowhere near the player he was during his final season in the WHL. It was unrealistic to think that he would put up the 31 goals and 54 assists he had in Regina, but it was expected that Hobbs would tally more than the 16 points he scored as a rookie. 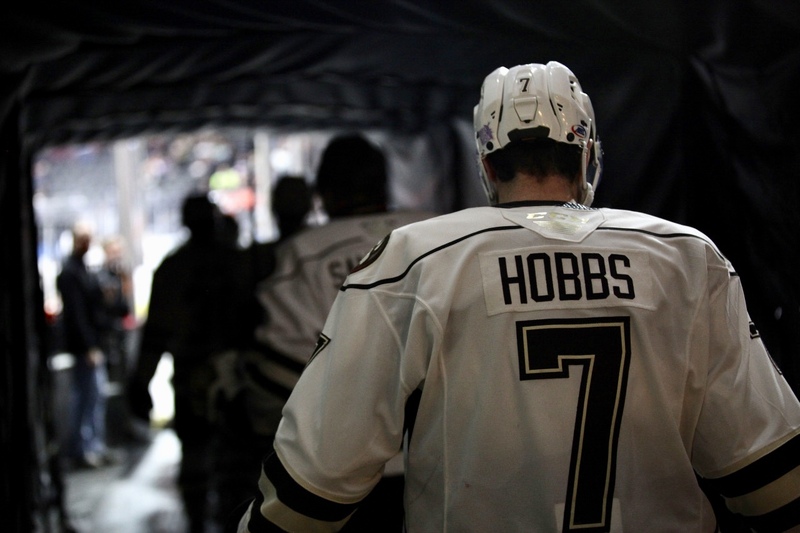 Hobbs’ disappointing season mirrored the season of the Hershey Bears. The Bears finished 26 points out of the final playoff spot and dead last in the Atlantic Division. The team ended the season with 69 points, the lowest since 1992-93 when the Bears had 66 points. Hershey won 30 games. The last time the Bears won fewer than 33 games was in 1992-93 when they won 27. Coming into the 2018-19 AHL season, there were plenty of changes in Hershey, starting with an entirely new coaching staff, spearheaded by head coach Spencer Carbery and assistant coach in charge of the defense, Patrick Wellar. The coaches wisely chose to keep Hobbs off of the top defense pairing to start the season. His play was noticeably better from the start. He was confident with the puck and his decision-making was markedly better. Offensively, Hobbs put up seven points in October. He looked more like the offensive player he was in Regina. He followed that up with six points in November. Unfortunately for Hobbs, the injury bug hit him again in November. He suffered an injury on December 15 during a game against Providence in which he was a season-worst -3. He would miss the next nine games. During his absence, the Bears went 4-5. The team struggled to create shooting lanes and ended up shooting too many shots into defending players. This is one skill Hobbs is good at. He can create open shooting lanes by faking a shot or by pulling the puck back, a la Roman Josi, and then finding a teammate with an open shooting lane. Hobbs returned to the lineup of January 11 and his return coincides directly with the Hershey turnaround. After dropping his return game in Springfield on January 11, the Bears have gone 11-0-1 since, and vaulted themselves back into the Calder Cup Playoff race. Hobbs’ return has strengthened the Hershey blue line depth. With the top pairing of Aaron Ness and Tyler Lewington excelling in that role, Hobbs stepped in to the second pairing with veteran Ryan Sproul. The duo has played well together, giving the Bears two solid defensive pairings. That pair has since been broken up with the returns of Lucas Johansen (from injury) and Jonas Siegenthaler (from the Washington Capitals, but Hobbs has continued to excel. During Hershey’s current 12-game point streak, he has two goals and two assists to bring his season point total to 17, one more than he had all of last season. More importantly, Hobbs has been good in his own end. He is a +5 during the point streak and has contributed on the penalty kill. The +5 is Hobbs best stretch as a pro and has brought his season +/- down to a -2 (was -7 after the January 11 game). The key now for Hobbs is to continue to progress and to stay healthy. At this point of the season, he is Hershey’s most-improved player. Those steps forward have helped to bring the Bears within two points of a playoff spot. This entry was posted in News and tagged Capitals Prospects, Caps Prospects, Connor Hobbs, Eric Lord, Hershey Bears, Washignton Capitals Prospects. Bookmark the permalink. He was one of the last cut from Caps camp this past fall. Should make a run for a position this fall. Let’s not forget that Conner Hobbs roommate is Colby Williams who is a great mentor and also helped Conner when the two played for the Regina Pats! More players should be as unselfish a player as Williams. He has great hockey sense.